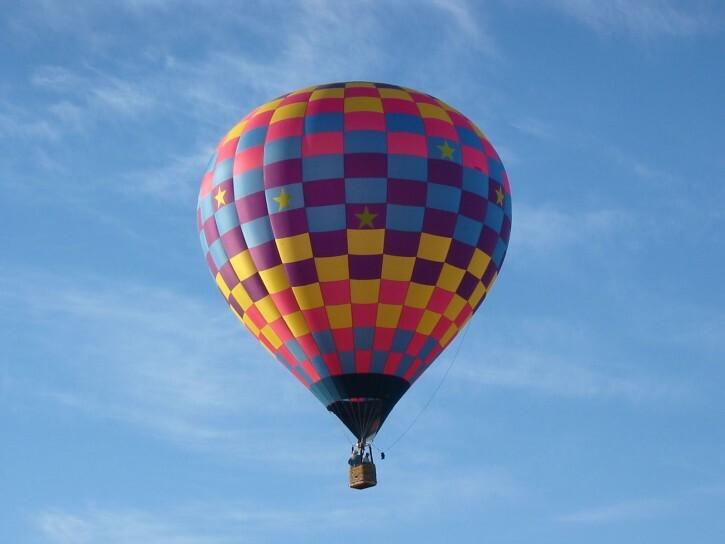 My friend, Teresa, usually takes her vacation in October and heads to Albuquerque, New Mexico for the Albuquerque International Balloon Fiesta. For a week or more she is able to witness races, rides, and more as hundreds of the world’s most accomplished balloonists convene for competition and display. Of course, the balloons themselves are bright and beautiful beyond imagination and often unique in shape. In 2012, Teresa’s trip was especially eventful because she volunteered to help a ground crew and was rewarded with a wonderful balloon ride. She was full of excitement as she told me of her adventure. I was able to fully relate to what she said since I had experienced my own similar adventure 15 years earlier. In 1997, a hot air balloon came to my city on a promotional tour for a national business chain. By an odd set of circumstances, the opportunity to ride was presented to me at an unheard of, ridiculously, low price. I seized the opportunity and was told when (6:30am) and where to be for my ride. On the morning of my flight I awoke at 4:30am surrounded by fear and anxiety—-what was I thinking? Why did I agree to this? Where was my faith? With my fear of height, I would surely hyperventilate and pass out! Yet a hot air balloon ride was on my list of “Things To Do Before I Die”–(aka “Bucket List”). So I calmed myself and arrived at the flight field on time. From that point on I was busy: I became part of the ground crew and was assigned certain tasks to ready the balloon for flight. I was the last person to board the basket (4 folks on our flight), and as I looked over at one of the ground crew members, he smiled and said, “Have a nice flight.” He held one of the tether ropes in his hands, and I remember watching the rope begin to slide through his hands as he slowly released his grip. I suddenly realized we were airborne, and the lift-off had been super easy and calm. I had a death grip on the west side of the basket, but our pilot (from London, England) quickly urged me to turn eastward to see the sunrise. “I’m afraid to let go,” I said. “Oh, you can move around the basket,” he said as he took my arm and guided me to the other side. After a few minutes I began to relax and even took pictures. My flight lasted 45 wonderful minutes; we flew at different altitudes—the highest being around 1800 feet. My hometown is situated between two large TVA lakes, and at one point, I could see one lake on my right and the other lake on my left. I was totally awe-struck; I knew it was only a tiny inkling of what God must see when he gazes earthward. “The wind blows wherever it pleases. You hear its sound, but you cannot tell where it comes from or where it is going…” John 3:8 (NIV). I pray you have a blessed March, and when you feel the wind on your face—remember the God who created it also loves you. If you ever get the chance to take a hot air balloon ride, don’t hesitate. It’s a decision you will never regret!